The holidays are upon us and we’ll be operating under a special schedule this week so that our wonderful team members can spend the season with their loved ones. Read on to learn more about our upcoming hours so you can plan your holiday gathering accordingly! Santa Claus is coming to town and we will be closing up shop at 3PM on Christmas Eve so we can go to sleep extra early! We will also be closed on Christmas Day, and we’ll resume normal hours on December 26. All of our non-24-hour locations will close at 9PM on December 31 and will reopen at their normal time on January 1. For those looking for a late-night snack, all our 24-hour locations will remain open 24 hours. So feel free to stop by to celebrate the new year at The Park After Dark with $4 select apps, $3 classic milkshakes, and $2 pie slices! 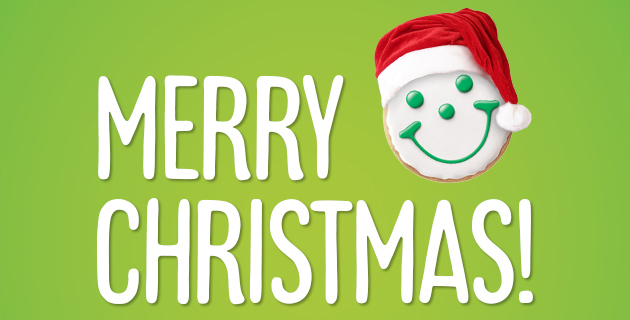 We wish you a smiley Christmas and a Happy New Year! With only a few more days until Christmas, you may be starting to feel the pressure that comes along with buying gifts for the many people you keep adding to your list. 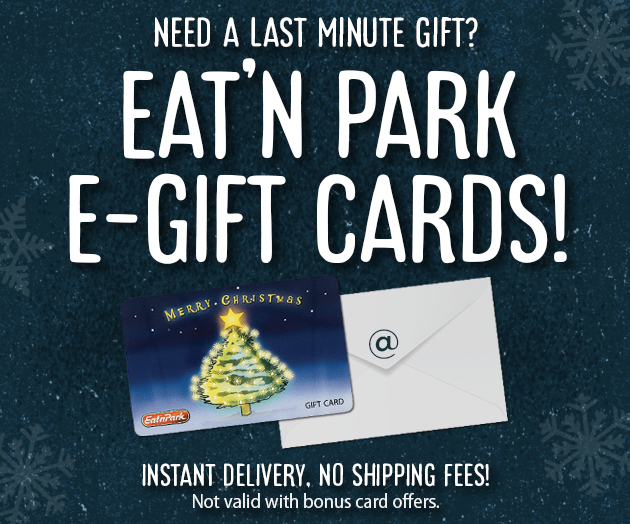 Make your last minute holiday shopping a breeze with Eat’n Park E-Gift Cards! 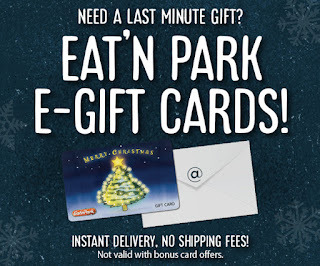 Eat'n Park e-gift cards are delivered almost instantly, and they're available all day, every day! Simply choose which design you want on your e-gift card, select a value, and personalize it with your own holiday message. Then print it out yourself or have it emailed directly to your recipient, who can print the card or just redeem it directly from their mobile device. What can we say, we make gift-giving easy! Click here to send your e-gift card now. It’s the holiday season and you should be enjoying quality time with your family, not spending all day in the kitchen! 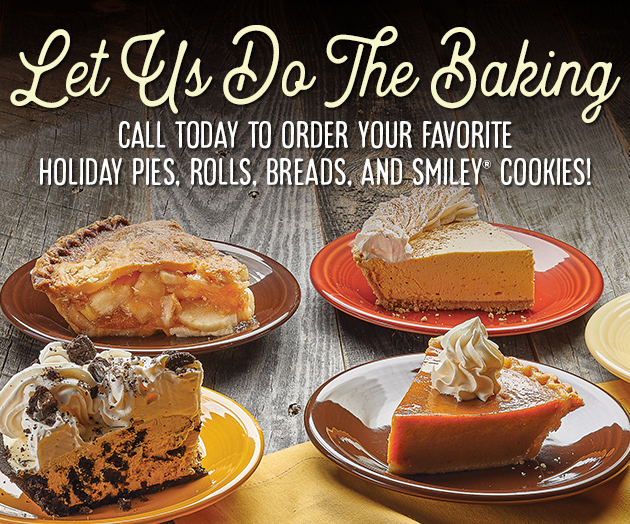 Let us take care of the dessert for your Christmas table and stop by to pick up one of our delicious fresh-baked pies! They're available in a variety of flavors including Oreo Crème, Coconut Crème, Apple and more. In fact, our Cranberry Apple Pie is on sale this month for only 10.99! Looking for a sweet treat for the man in the big red suit? 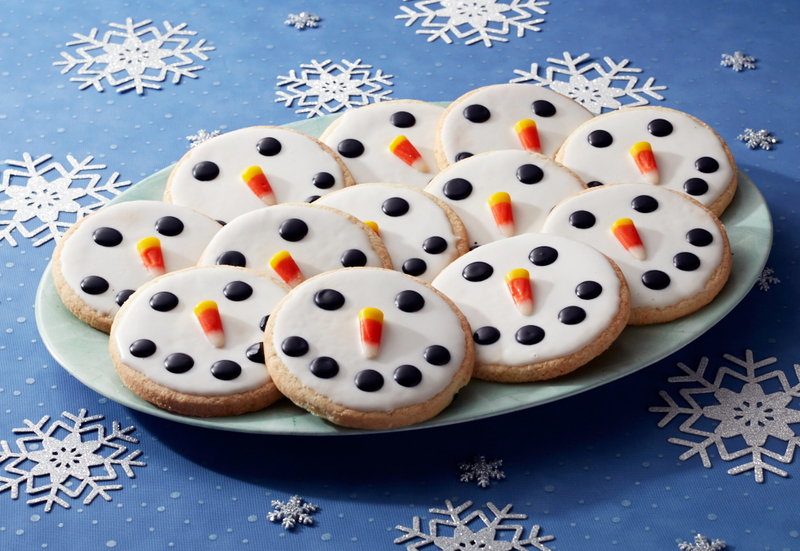 Our Snowman Smiley Cookies are sure to put a smile on Santa's face after his long journey from the North Pole! Pick up a dozen today for only $6.99! Don’t forget – we also have homemade breads, rolls, and buns for you to enjoy around the table. Click here to download our bakery order form then call ahead to your local Eat’n Park to place your pie order today! 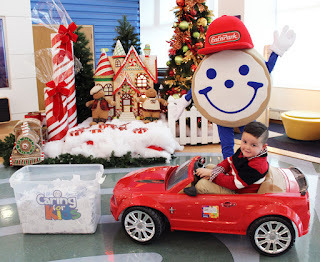 Congratulations to the winner of our Caring for Kids car raffle! 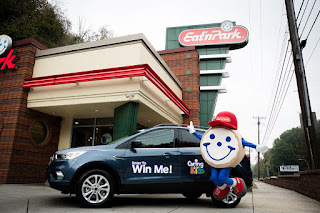 The lucky winner of the 2018 Ford Escape--so generously donated by Neighborhood Ford Store--is Ron F. of DuBois, PA.
Ron's winning ticket (number 013137) was randomly selected from more than 45,000 tickets purchased to benefit Eat'n Park's Caring for Kids campaign. Ron will be receiving the keys to his new vehicle in the upcoming weeks. From Christmas Tree lightings to local carolers, we can feel that there is holiday magic in the air. As a special gift to you and yours, we hope you enjoy not one, but two great coupons to help put you in the holiday spirit! Coupons valid Tuesday, December 5 - Monday, December 11, 2017 only. Coupons valid December 5-11, 2017 only. We're excited to announce some great news... we've added a few new items to our menu! Read on to learn all the details about some of our new favorites! One of our guest favorites has returned! 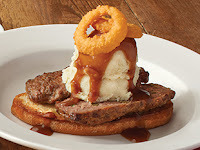 Savor our classic meatloaf with mashed potatoes, gravy, and crispy onion rings on buttered and grilled Italian bread. Plus, we serve it with your choice of one side. 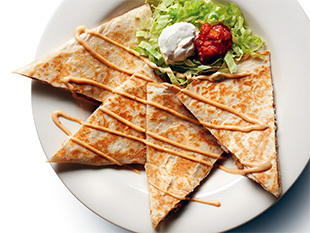 Our Chicken Quesadilla can now be paired with a side of your choice to make it a well-rounded meal! Enjoy our flour tortilla stuffed with fajita seasoned chicken, pepper Jack cheese, and caramelized onions. It’s drizzled with our chipotle sauce, and served with salsa, sour cream, and a side of your choice! 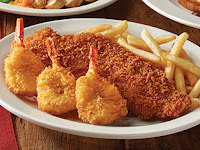 Set sail with this sea-riously delicious platter that includes our famous Whale of a Cod fillet paired with three crispy butterflied shrimp tossed in OLD BAY Seasoning. It’s served with both tartar and cocktail sauces, and includes your choice of two sides and bakery-fresh rolls. 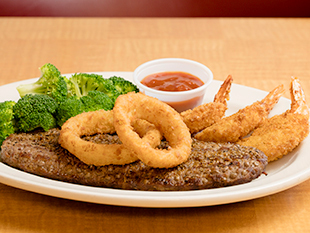 The best of land and sea, enjoy our classic Ground Sirloin topped with onion rings as well as three crispy butterflied shrimp tossed in OLD BAY Seasoning. We serve it with cocktail sauce, your choice of two sides, and bakery-fresh rolls. 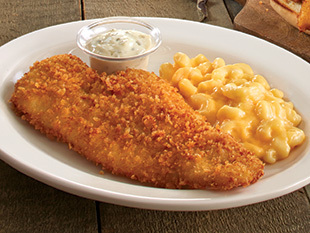 Two of our favorites on one plate! 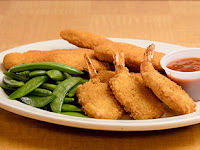 Enjoy five of our breaded chicken tenders served with any of our dipping sauces or tossed in Buffalo sauce along with three crispy butterflied shrimp tossed in OLD BAY Seasoning. 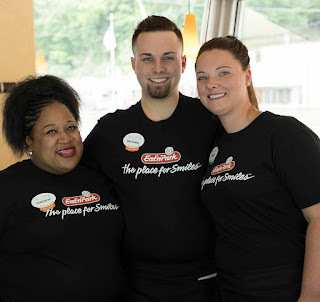 We serve it with cocktail sauce, your choice of two sides, and bakery-fresh rolls! 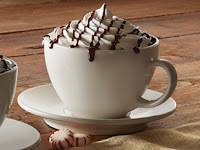 Warm up after you've finished dashing through the snow in your one horse open sleigh with our new Raspberry or Peppermint Hot Chocolate. It comes with one free refill and is the perfect way to warm the soul. 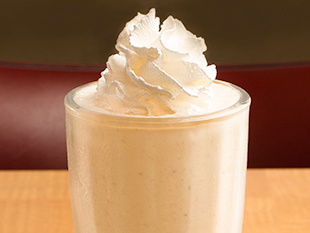 A delicious new addition to our milkshake lineup, our Bananas Foster shake includes fresh banana, our Bananas Foster syrup, and vanilla ice cream. Plus, we top it with whipped topping for the perfect finish. Our Turtle Cheesecake has returned! 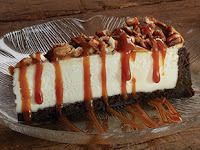 Complete with creamy cheesecake on a chocolate cake crust, we also top this sweet treat with chopped pecans, milk chocolate, and drizzle it with caramel. The holidays are here and you’ve been dealt a very serious task… finding the perfect gift for everyone on your ever-growing list: the mailman, babysitter, teachers, it goes on and on! But what do you buy for those folks for whom you want to show appreciation, but have no idea what they would like? How about Eat’n Park gift cards! And for a limited time, you'll get a FREE $5 bonus card* with every $25 in Eat'n Park gift card purchases at our restaurants, while supplies last! It's like a reward for being such a great gift-giver! 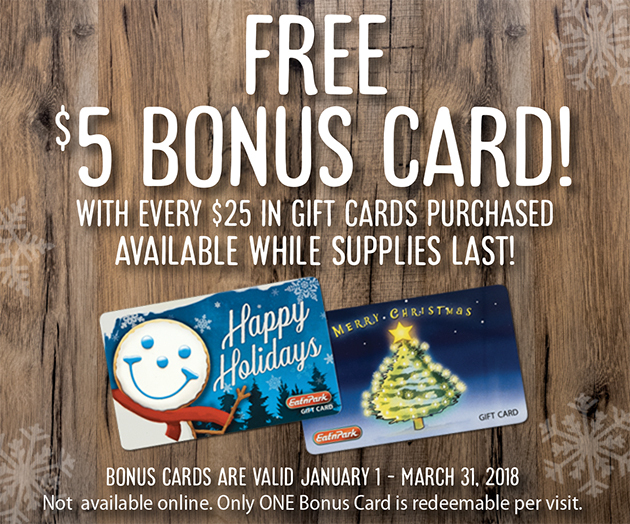 Bonus cards are valid from January 1 through March 31, 2018. 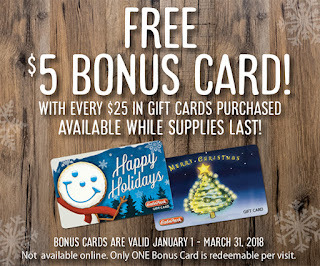 *Bonus cards are only available at Eat'n Park restaurant locations while supplies last. This offer is not available with online gift card orders or e-gift cards. Bonus cards may be redeemed one per check from January 1 – March 31, 2018. Multiple bonus cards cannot be redeemed on the same check. 12.2.2017 Weekly Caring for Kids Activities at Eat’n Park! We’re heading into the final stretch of our Caring for Kids campaign – it ends December 10! 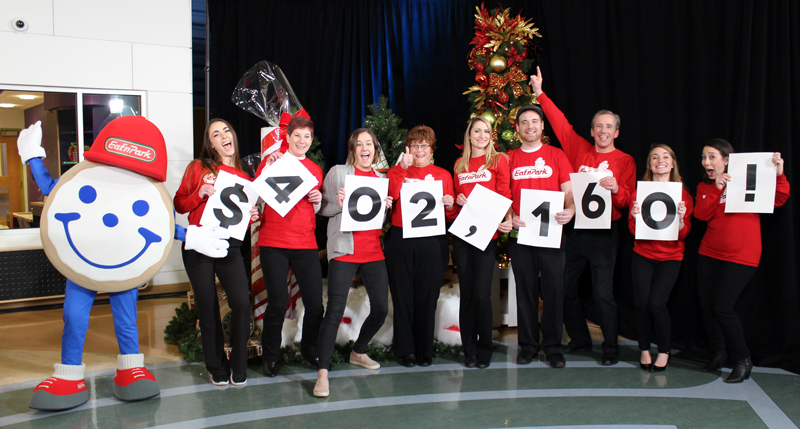 Read on to learn what’s happening at some of our locations for the final week of the campaign. Plus, don’t forget that One Day, One Dollar will be taking place THIS SATURDAY, December 2. On this day, all our restaurants will come together in an effort to raise $10,000 IN ONE DAY for local children’s hospitals. We hope to see you there! Enjoy decorating cookies, pictures with Santa, and delicious snow cones! Enjoy face painting, magicians, acoustic acts, bell ringers, and more! Tickets are $40 and can be purchased at the restaurant or at the door.